What is Dry Eye Syndrome, the dry eye symptoms, and what causes dry eye? There are many different causes of dry eye syndrome which can work independently or in combination to create the symptoms associated with dry eyes. Causes can be environmental, lifestyle-related, age-related, or due to medications or disease. Meibomian Gland Dysfunction (MGD) is also thought to be the leading cause of dry eye disease. This article is designed to give you an overview of several causes of dry eye syndrome but does not cover all known causes. If you are feeling any of the symptoms of dry eyes, or are feeling any kind of discomfort in your eyes, please contact one of our optometrists to make an appointment or discuss your symptoms with us over the phone. Meibomian Gland Dysfunction (MGD) results when the Meibomian glands cease to function optimally. Blocked glands cannot secrete the oils necessary for maintaining a healthy tear film. MGD is believed to be the —and is thought to be the leading cause of dry eye disease. However, MGD is more than just ‘dry eyes’ or ‘sore eyes’. These symptoms may get much worse for those with MGD and, if left untreated, MGD can result in permanent damage to the eyes. MGD can exist as a single disorder but is often associated with several other diseases such as posterior blepharitis, anterior blepharitis, primary meibomianitis and/or seborrheic dermatitis. Though the term “MGD” covers a wide number of conditions, the major symptoms are blocked oil glands with thickened secretions. If left untreated, these chronically clogged glands are unable to secrete oil and permanent changes in the tear film will result as well as chronic dry eyes. The recognition and treatment of MGD will result in eliminating dryness, inflammation and discomfort and is very simple to treat. Patients with MGD often have red, puffy eyes which have implications socially and at work while the itchiness reduces quality of life. It is often impossible for patients with MGD to wear contact lenses. Diagnosis and treatment of MGD is also a very important step in avoiding complications with cataract and refractive surgery. There are many symptoms associated with Dry Eye Syndrome and some may affect you more than others. Some of these you may not even be aware of! Therefore, it is important to have a comprehensive dry eye assessment in order to record your symptoms, tailor a dry eye treatment action plan, and to monitor improvements or changes over time. 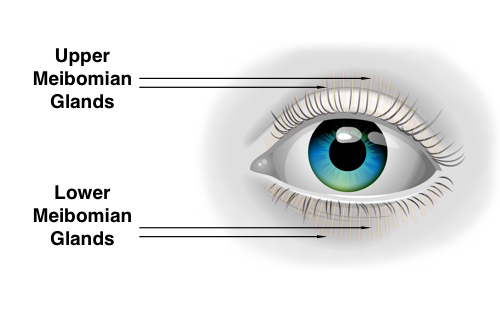 Below is a list of some of the symptoms frequently associated with dry eye syndrome. Many of these symptoms occur together. You may also notice that watery eyes is also a symptom of dry eyes. This may at first seem counter-intuitive. However, wateriness is a reflex action where your body is producing tears in response to dryness. In the case of Meibomian Gland Dysfunction, where your tear film evaporates too quickly, this reflex wateriness does not help improve the condition and often becomes a nuisance. There are many causes of dry eyes and they often occur simultaneously. Some of these conditions are related to lifestyle or environmental factors, while others may be associated with disease, medication, surgery or injury. As part of your comprehensive dry eye assessment, we aim to find all the causes of your dry eye syndrome so that we can tailor your dry eye treatment action plan. Not all dry eye symptoms are treated the same way and we aim to work with you to get the best result possible. Exposure to environmental factors, both outdoors and indoors, can exacerbate the symptoms of dry eyes. Symptoms of dry eye can often be reduced by avoiding or reducing exposure to these environments. Outdoor factors which negatively affect eye syndrome include dry weather, low humidity, wind, cold, smoke, and high altitude. Indoor environmental factors which can make your dry eye symptoms worse include forced heating or air conditioning inside the home or office. Shopping centres can also be very irritating for dry eyes as well as airplane cabins. Your lifestyle has a strong influence on your overall health. This includes the health of your eyes. By making a few simple changes to your lifestyle, you can significantly improve your dry eyes. Your diet, smoking and consumption of diuretics without proper hydration can also play a part in causing dry eye syndrome. One of the most common, and underrated, causes of dry eyes is incorrect, or infrequent, or incomplete blinking. Staring with a fixed gaze for prolonged periods often results in reduced blinking which is vital to the regular production of the tear film. Increased usage of digital device usage (computers, tablets, smartphones) as well as non-digital documents (magazines, books, newspapers) is associated with dry eyes. Blink Training forms part of your dry eye treatment action plan where your optometrist will provide you with blinking exercises to help keep the muscles and the lubricating action of your tear production system functioning. Pausing what you are doing, then completing a slow, complete blink, and doing this regularly, can help retrain your brain to blink correctly—starting you on the path to reduced dry eye symptoms. In fact, you should try this right now before you continue reading! Various medications have been demonstrated to play a role in either causing, or increasing, dry eyes. Some of these medications which are associated with dry eye syndrome are antihistamines, beta-blockers, antispasmodics, diuretics, antidepressants, hormone replacement therapy, oral contraceptives, blood pressure medications. Dry Eye Syndrome is also associated with Accutane, chemotherapy and radiation. Many people with allergies also report symptoms of dry eyes. This is especially prevalent in the southern part of Australia where allergies are more common. Avoiding those things which trigger your allergies can provide relief from dry eyes in some patients. Common allergies associated with dry eye syndrome are hayfever, pollen, dust or animals. Several medical conditions are known to cause dry eyes, such as, diabetes, autoimmune diseases (such as, Sjögren syndrome), rheumatoid arthritis, Bell’s Palsy. These require different treatments to those associated with other causes, such as Meibomian Gland Dysfunction. However, Blepharitis (eyelid inflammation) is associated with Meibomian Gland Dysfunction and can be treated with eyelid scrubs, Blephex™ as well as Blephadex™ foam cleanser and tea-tree based wipes. Nocturnal lagophthalmos — a condition where the eyes don’t fully blink and stay partially open at night — as well as recurrent corneal erosions — when the cornea and eye lid stick together at night — can cause dry eyes. Similarly, any obstruction of the lacrimal glands will be associated with dry eye syndrome. The most common cause of dry eyes is associated with Meibomian Gland Dysfunction (MGD). This is a blockage of the meibomian glands which secrete the lipids (oils) that protect the tear film from evaporation. There are different causes of this blockage which will result in eventual atrophy of the glands. Once these glands have died off, they cannot be recovered. Therefore, it is essential to have early detection and treatment of blocked glands in order to avoid further complications. Certain eye surgeries are commonly associated with dry eyes — especially vision correction/laser eye surgery and cataract surgery. Trauma to the eyes, such as impact injury, or burns, can also result in dry eye symptoms. We can co-manage your condition with your ophthalmologist or GP in order to best understand and treat your dry eyes. We also recommend assessment of your eyes before embarking on eye surgery so that you and your ophthalmologist can understand the risks that may be associated with the surgery. Though modern contact lens technology has improved in recent years to be more breathable/gas permeable, contact lens wear is associated with dry eyes. Contact lenses can increase symptoms and even, in some cases, cause dry eye. Our optometrists can recommend the contact lens type that is right for you. Also, if you are thinking of wearing contact lenses, a dry eye assessment will help us understand the health of your eyes and to make recommendations based on the results. Disclaimer: This article is for information only and should not be used for the diagnosis or treatment of medical conditions. The Dry Eye Group has used all reasonable care in compiling the information but make no warranty as to its accuracy. Please consult our optometrists, or other health care professional for diagnosis and treatment of medical conditions.